In just under 30 years of existence, Pixar has amassed an incredible amount of goodwill from audiences around the world, giving the studio more respect than any other film studio in Hollywood. In recent years, the universal praise that the studio usually garnered has wavered, with Toy Story 3 (2010) being Pixar’s last mega-success. 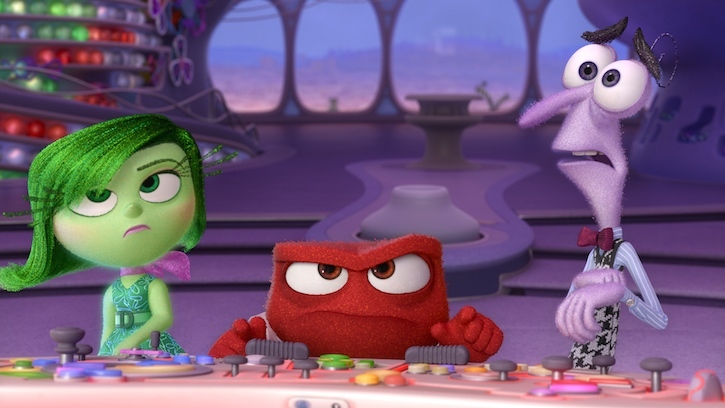 Even though both Brave and Monsters University were quality films, this year’s spectacular Inside Out will be the film that reminds viewers that Pixar has no equal in the film business. Read my spoiler-free review after the break! 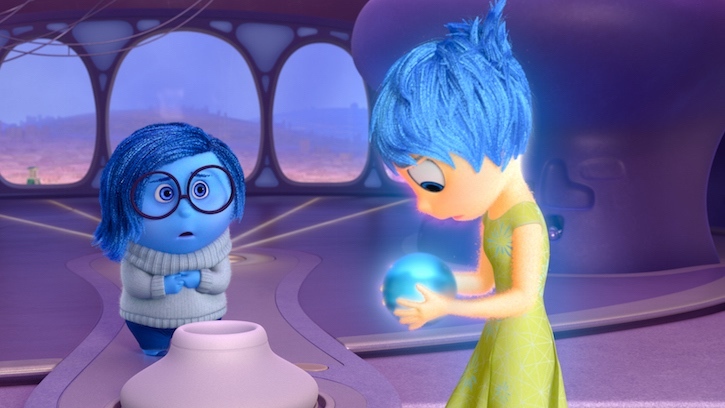 Inside Out spent over five years in development, more than the average Pixar film takes to make the jump to the big screen. Although director Pete Docter and co-director Ronnie del Carmen acknowledged there were stumbles along the way, you would never know it from the final product. The plot and script are the closest thing to the perfection that is the original Toy Story, as the pace of the film moves beautifully. The film’s running time is clocked at just over 90 minutes, but you would never know it, as the story ends with you begging for more time in the creative world created by the filmmaking team, long before it overstays its welcome. The film begins with an introduction to the emotions that live in 11-year-old Riley’s mind, told alongside some pivotal moments from her infancy. The emotions include Joy (Amy Poehler), Sadness (Phyllis Smith), Disgust (Mindy Kaling), Fear (Bill Hader), and Anger (Lewis Black). The main part of the story kicks off with Riley and her family moving from a Midwestern town to the big city of San Francisco. Understandably, the move sends her mind into chaos mode. The parallel storytelling established early on is an inspired choice. While Riley encounters challenges in her day-to-day life, we see the role her emotions play on the inside, and it all works wonderfully. The reason for that is the distinct difference in visual style between the real world and the world inside Riley’s mind. Although the artists at Pixar obviously had inspiration for how to make the outside world look, with San Francisco lying just a few miles from the studio’s campus in Emeryville, the mind world was an invention. Sure, concepts like long term memory and train of thought are utilized, but there were infinite possibilities for how to illustrate them and make them accessible for an all-ages audience. The genius with which the mind world was created is perhaps the best realization of how our minds work, instantly making Inside Out the film people (children and adults) will turn to when trying to understand, to borrow from the film’s marketing, ” the little voices” inside our heads. Many studies have been done on emotions and what they are exactly, especially given the differences present in various cultures. Docter and his team spoke to various scientists, psychologists, and experts, and ultimately settled on the five emotions you see in the film. 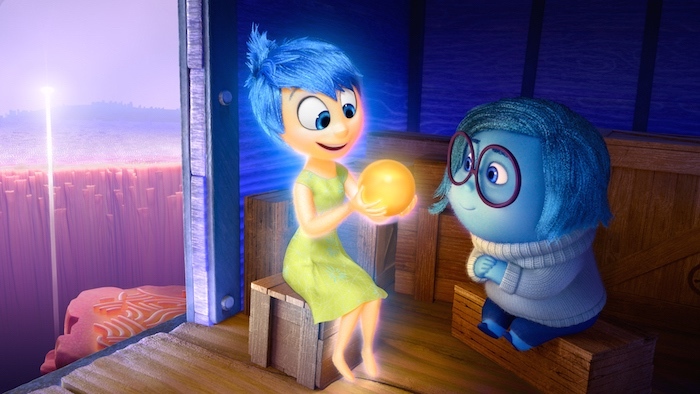 Joy is the lead emotion, with great voice work from Amy Poehler. Playing a character who is essentially always happy could have made Joy over-the-top in the annoying department, but Poehler is an incredible talent. Actually, all the voice work in the film is superb, from the five comedians cast to play Riley’s emotions, to the cameos by Pixar stalwarts like John Ratzenberger. Besides Poehler’s Joy, there is Sadness, played by Phyllis Smith, and a character voiced by Richard Kind that has largely been left out of the film’s marketing campaign, who provide masterful vocal work. Kind’s character, particularly, does not get much screen time, but you will be thinking of him long after the credits roll (oh, those credits – we’ll get to that below). Pixar has never indulged in stunt casting, preferring to match the roles to those actors it believes will capture the essence of its characters. That has never been more true than with Inside Out, which, after Toy Story and Finding Nemo, features the best voice work in a Pixar film. 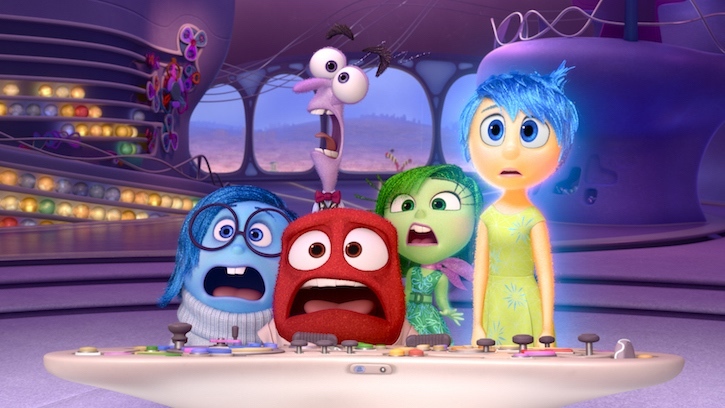 Inside Out is, hands down, one of Pixar’s funniest films. The film’s emotional story is well-balanced by a large number of gags related to the mind, memory, thoughts, dreams, etc. Children will laugh hysterically at the gags. It is the sophisticated humor, aimed squarely at adults, though, that sets this film above most other “all-ages” films. Much of the humor is absurdly clever – they are based on the real ideas of how our mind works, which simultaneously makes you bowl over with laughter and go, “Aha!” Two of the best examples of this is explanations for what abstract thought is and why songs get stuck in your head. Almost every single joke advances the story, entertaining viewers by giving them pause before getting emotionally walloped. The humor in this film is necessary, not only because we would otherwise spend our time crying throughout the film, but also because it provides more context to the worlds the characters inhabit. Where the credits are involved, it’s pure humor and ingenuity. I won’t spoil what happens here, but we essentially get a broader look at how the mind works. Don’t run out of the theater as soon as the film is finished – you will regret it!